"Direct from a West End run and a sell-out tour of Asia, The West End Men return to the UK with a brand new show celebrating the leading Men of the West End. 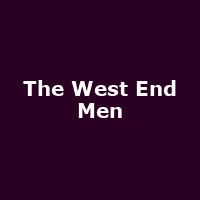 Performing songs from the biggest shows in the World as well as a selection of some of the best rock and pop classics, The West End Men showcases the talent and prowess of some of the finest performers of this generation. This new show, which features X-Factor finalist Marcus Collins, Glenn Carter, Alexis Gerred and James Bisp promises to take you on a journey to the very heart of the West End and its leading Men."